To learn more about Centering Prayer, click HERE. All are welcome. If you are not experienced with Centering Prayer, we will gladly explain and walk you through it. 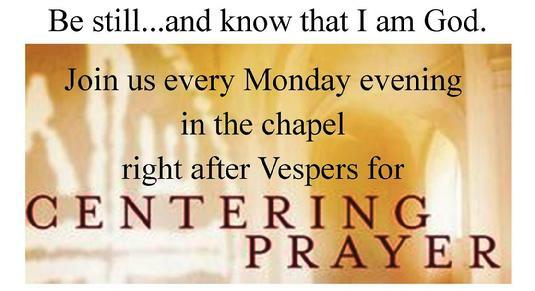 We begin at 6:45 on Monday by praying Evening Prayer with oher groups from the parish. Evening Prayer usually lasts about 15 minutes. 7:00 - 7:15 Pre-Centering "Relaxation: A 10 minute meditation in the garden (weather permitting), or relax to music in the chapel. Prepare to Center: If needed, we would review the steps to centering. End Centering Prayer: Chimes, prayer the Lord's Prayer together. Group Discussion: Usually on the current book or a topic we feel the Holy Spirit has led us to discuss. For more information, please contact Mike Huff: mhuff3@cox.net; 757 488 6940.